Today, Linda will take a flight to Armenia, the heart of the Coffee Triangle. She will be escorted to the charming hotel of Hacienda El Delirio, located just below the Andes—a prime base for spectacular views. Officially known as the Colombian Coffee-Growers Axis or Eje Cafetero, this region is famous for the production of some of the best coffees in the world. Here visitors can tour the plantations, and learn about Colombia’s fine art of coffee harvesting and roasting. The tour is naturally followed with a tasting of delicious samples. 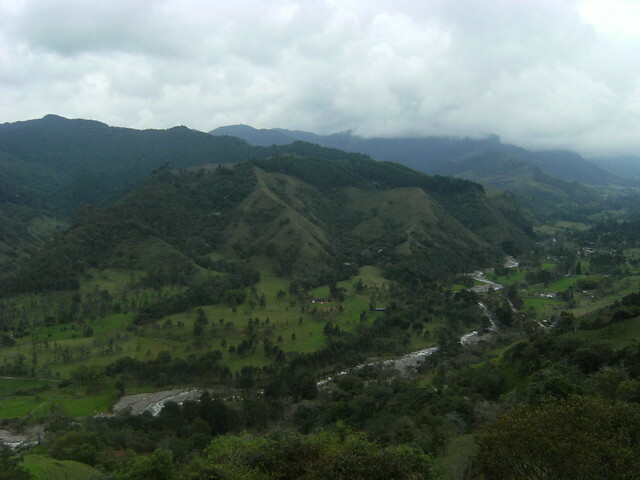 You can also hike in the beautiful Cocora Valley and view the 200-foot wax palm tree. The lush Cocora valley is part of the Los Nevados National Natural Park, which covers 58,000 hectares and protects a number of endemic species: palms, toucans, sloths, pumas, tapirs, the Andean condor and many more. There’s some great hiking through the valley, especially via the Acaime route, 2 ½ hours walk starting from Salento. As this is a physically challenging walk, bring your gear—you can also opt for a guided horseback tour. Stop in charming Salento for the colorful Antioquian architecture or to sip on the local anise-flavored liquor, Aguardiente. The region is famed for its food: from the Bandeja Paisa—a blend of rice, beans, meat, avocado, sausage, bacon and sweet plantains—to the buñuelos cheese balls and caramel wafers. Known alternately as Ceroxylon quindiuense and Palma de cera del quindio, the wax palm is native to the Cocora Valley and Colombia’s national tree. Until recently it was widely used in the making of candles, timber, food and in celebrations of Palm Sunday. The Colombian government has since declared the trees under federal protection, and they grow relatively unharmed in the mountains—much to the benefit of several other species, including the endangered Loro Orejiamarillo (yellow-eared parrot), who make wax palms their homes. Palm trees are often associated with sand and sun, but this subspecies only grows in the high altitude of the Andes, making for beautiful frontispieces against the backdrop of rolling clouds and lush mountains. Reaching up to 50 m tall, the wax is the tallest palm in the world and can live up to 100 years. The journals of famous German explorer and naturalist Alexander von Humboldt describe it in 1801.